Lapiztola Stencil Collective, Spray for Us. Lapiz = pencil. Pistola = pistol. Lapiztola is a stencil collective in Oaxaca. The pun suggests the pencil is as mighty as the pistol. Their artwork has been described a visual poetry. In October, one of Lapiztola’s crew, Yankel, was on a conference panel in Oaxaca about the city’s street art collectives. 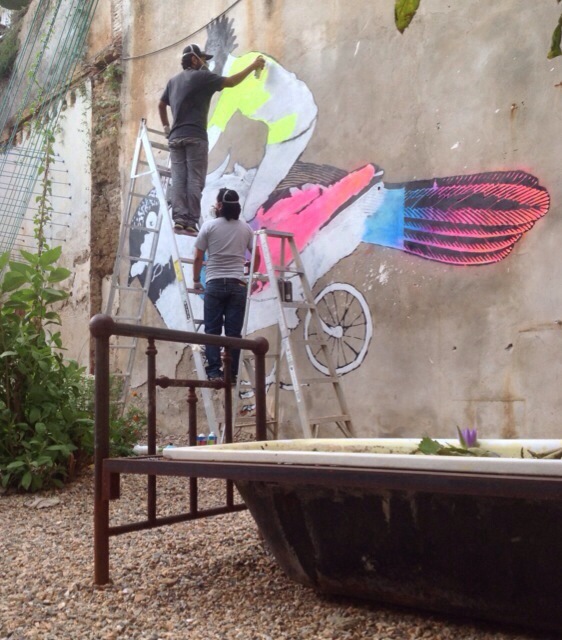 Yankel had spent much of the day on a ladder wearing a respirator mask spray-painting a luminous sparrow on a wall at Matria Art Garden a few blocks away. Another artist in the audience proclaimed his love for Lapiztola, but added compared to more radical street collectives he found their stencil murals “decorative and appropriate for restaurants.” –Decorative? OUCH! Rosario, Yankel and Roberto of Lapiztola. Walls are where you find them. Yankel responded, sure, Lapiztola might accept invitations, but they would never let a restaurant owner dictate subject matter. They might even get reimbursed for their paint, but they don’t profit from their work. Reflejos de Huida, stencil, 2013, Lapiztola. Yankel talked about a piece that had appeared in MACO, the Museo Arte Contemporanea de Oaxaca. Reflejos de Huida featured a little boy and birds escaping from a cage. Their inspiration was a real boy they met on the streets who lived a life of extreme stress. Even more than most children he dreamed of escaping the confines of his domestic life. Lapiztola’s art includes the iconic imagery of M-16’s, molotov cocktails, and skulls found in Oaxacan street art since 2006. Lapiztola, however, adds their own visual vocabulary: birds; street musicians; indigenous children. Their work often deals with street-level domestic issues like child welfare and displays a special empathy for Mexico’s children. Mural image from Lapiztola’s tumblr. Rosario and Roberto are trained in graphic design, while Yankel studied architecture. Due to their mix of backgrounds the collective’s projects are both graphically crisp and site-specific, taking full advantage of a particular wall’s potential. Shop gate project in Tijuana. Mexico © Lapiztola from their blog. One of the wonderful things about stencils is how the elements can be repurposed. Below Lapiztola reused their accordion playing boy (spraying through the reverse side of the stencil) to collaborate with French artist Seth Globepainter. Lapiztola’s artwork looks clever online. Clever is good, but in person, their large-scale visions are more than clever. They are fantastic. They have clarity, visual impact and soul. Commentary on Genetically Modified Corn, Lapiztola, Oaxaca. Check out Lapiztola on Facebook and via their blog. For more info, see Jeffrey Pena’s fine interview with Lapiztola at Curbs and Stoops. < Previous Kate Santee, Illustrator and Roller Girl!